Do you remember back in the 90’s when the internet was becoming the next big thing? That nostalgic sound of a screeching dial-up modem and waiting half an hour to download a single MP3 file? Things have changed quite a bit since the 90’s. Not just the terrible fashion and bad music, but also the sheer scale of the internet; along with the opportunity that it represents for marketing and promoting your business on the web. Did you know there are over 1 billion websites in the world today? In this overcrowded space, how can you cut through the noise and be seen? SEO (Search Engine Optimisation) is about maximising your website’s potential for being displayed in organic search results, based on the terms users are searching. A stronger SEO strategy means more potential clicks to your site and more opportunity for conversion of leads to customers. 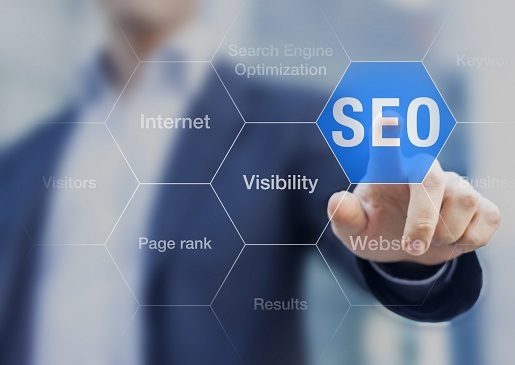 Here are four of the key ingredients that should be part of your SEO strategy to get your business seen in the digital age. On-Page and Off-Page On-Page SEO refers to everything you can see on a web page. It includes the quality of written content, keywords, titles and descriptions, the naming of URLs, responsive design, load speed and use of HTTPS protocol. It forms the bulk of the end user experience. The most important factor of on-page SEO is making sure you have quality, easily readable content that addresses search terms users are typing to arrive at your site. Off-page SEO is the behind-the-scenes technical setup including your site authority (the trust Google has in your site), quality of inbound links, bounce-rate of visitors, country and locality, and online social reputation. Site authority and link quality are the major factors here. Are you using a website hosting company that’s reputable, rather than going for the cheapest option? You’ll also want to carefully select the businesses you reach out to with requests of linking back to your site. Low-quality sites linking to you can bring your own score down. Google wants to provide the best experience for its users, meaning location becomes a factor in which results get returned. Typing a search term like “business seminars”, for example, will return very different results when you’re in Sydney to what it would in New York. Google knows that people often search for events near to their location and therefore wants to return the most relevant results. That’s good news if you’re a business with a physical presence or local customer base. To help get found in localised search results, make sure your business is listed on Google My Business – it’s free and easy to set up. You’ll also want to have your business name, address and phone number across your site. Listing it your site footer is a simple way to do this. There’s been a clear push from Google right now towards a more secure internet. HTTPS is already an SEO ranking factor and is likely to further increase in coming years. Obtaining a security certificate for your site is inexpensive but if you’re changing from an existing HTTP site, you’ll need to have a clear strategy including examining and updating internal links, getting your preferred primary domain identified and forcing HTTPS with redirects. Site content is a huge factor for SEO so your business should treat it with priority. Does the text on your pages answer the questions users may have? Do you have CTAs (Calls to Action) providing users with more information or downloadable resources and keep them engaged? When writing content, think of what terms a typical user enters to arrive at your site, then work backwards. Google Search Console can help you identify some of those terms by looking at historic site data. Creating regular blog content focused on topics related to your business’ products or services can be an effective way to increase your web visibility. Just be sure to keep your blogs easy to read and providing value to your audience. These are just a few of the main factors that can influence SEO and help your business get seen. There’s still a lot more to understand and explore, so if you don’t have a strong strategy, it’s worth talking to an expert. Having the right plan in place will ensure your website SEO and visibility aren’t stuck back in the 90’s with those dial-up modems.